To understand the suffering that Jesus endured before going to the cross, you can make a crown of thorns. Don’t even try to do this with children, or they will cry. Make it yourself, and then have the children gently touch the thorns to understand the pain that comes from being pricked by thorns. You will need rose stems, kitchen shears, and hot glue. 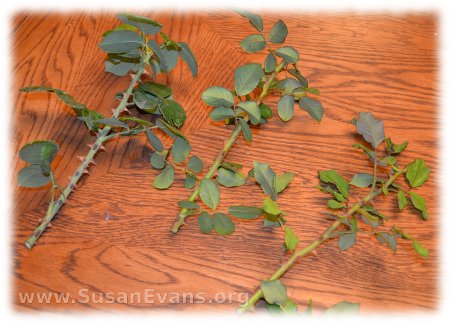 Clip off some stems from your rose bushes, especially in the late fall when you need to cut them back anyway. You might want to wear gloves. I didn’t. 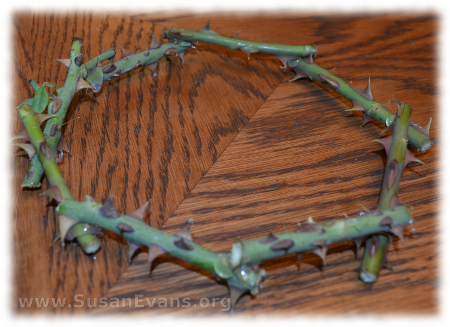 As I made this simple 5-minute craft, I was choked up because I imagined what it must have felt like to wear a crown of thorns and have the crown pushed down on your head. Of course, blood dripped from the head of Jesus when this happened. 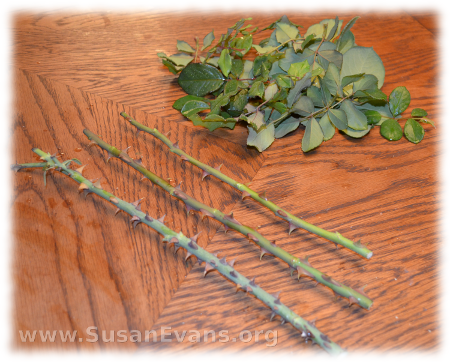 Strip off the leaves, and cut small sections of the thorny rose stems. Now hot glue them into a circle. You are finished. This was the most painful craft I’ve ever made, but I’m glad that I did it without gloves because I feel closer to my Savior, who suffered unspeakable agony on the cross just so that I could be saved from my sin. If you enjoyed the spiritual significance of this craft, you will love Using Simple Costumes and Props to Teach the Bible. You receive this 2-hour video for free when you sign up for the Unit Study Treasure Vault, which has an enormous Bible section that you will love! This entry was posted on Friday, October 25th, 2013 at 7:48 am	and is filed under Bible. You can follow any responses to this entry through the RSS 2.0 feed. You can skip to the end and leave a response. Pinging is currently not allowed. The hands-on crafts and teaching is the most memorable and the most fun. It brings back a lot of memories for me, as a homeschooling mom whose children are now grown! What a great way to visualize what the crown of thorns might have looked like. Good for kids and adults. The painful aspect of the craft brings out how much Christ had to suffer for us.